Cooler than usual weather for July greeted the racers and the time slips showed quick ET’s for many of them. 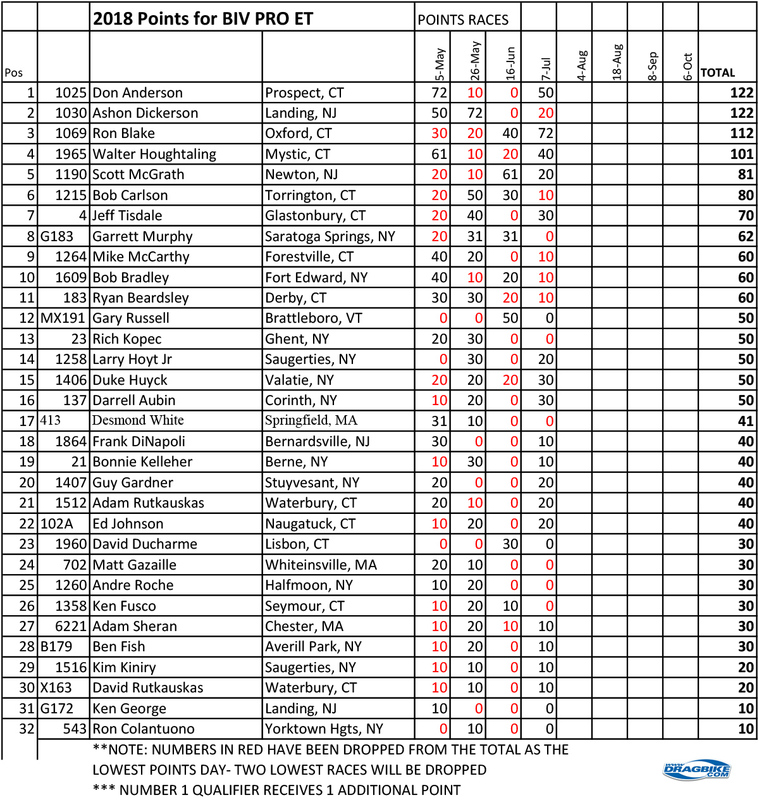 Vantine Nitrosports posted the #1 qualifier money in the DME 9Below class and it was taken by Bob Carlson. He ran a 7.995 e.t. Not only was that number good enough for the cash for the quickest qualifier spot, nobody ran faster than that all day. At this point Bob was probably feeling like he would have a big day. This would not be the case! Guy Gardner was the next racer to cash in when he grabbed the #1 qualifier money inM2 Shocks Street ET that was posted by MTC. He had an .013 light! 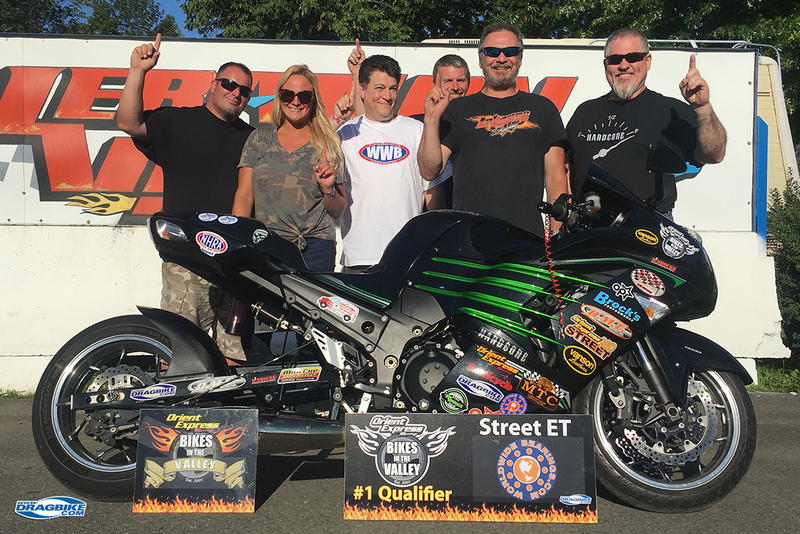 Ben Knight made his trip from Virginia pay off early when he nabbed the #1 qualifier money that was posted by Worldwide Bearings in the Vanson Leathers Pro ET Class with his great .002 reaction time! 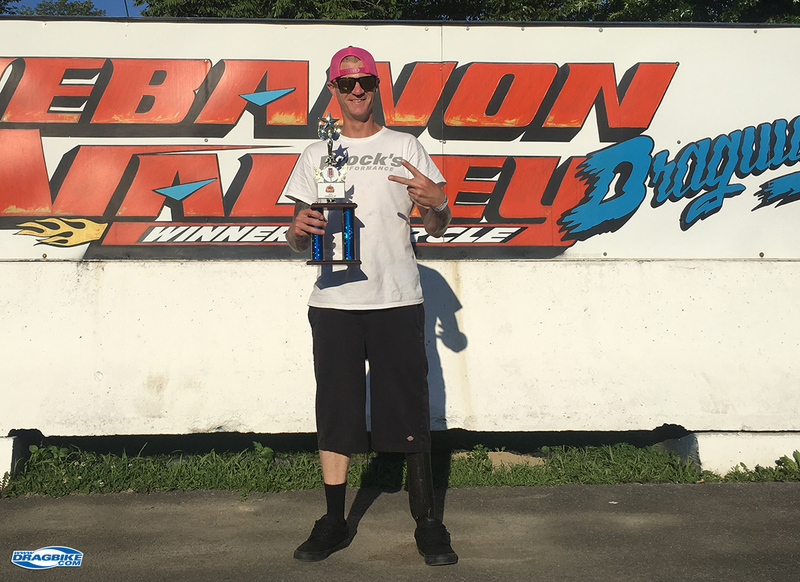 He was in eliminations in the late rounds in all three classes as well, winning one class and taking runner-up in another! Eliminations began with DME 9Below. John Civitarese (everybody calls him Civi) took the win in a double breakout final over Ben Knight. Civi ran 8.061 on his 8.07 dial in, Ben ran just .006 farther under when he ran 8.885 on his 8.90 dial in. Ben had grabbed the reaction time advantage, but took a bit too much stripe and handed the win over to Civi. 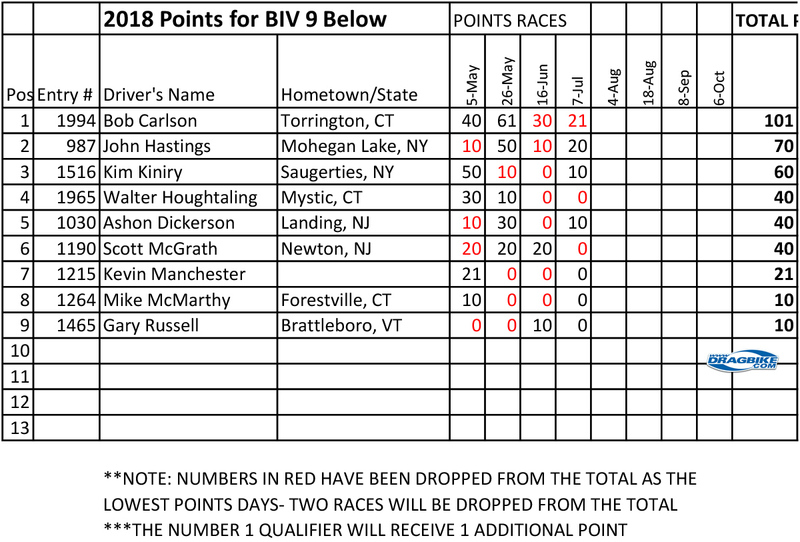 Civi had just missed the number one qualifying spot and was in at number 2 just .04 behind Bob Carlson at 8.036. Ben had qualified in the number 8 spot with a 8.850 e.t. Ben also had the honor of sending Bob Carlson to the trailer in round two. 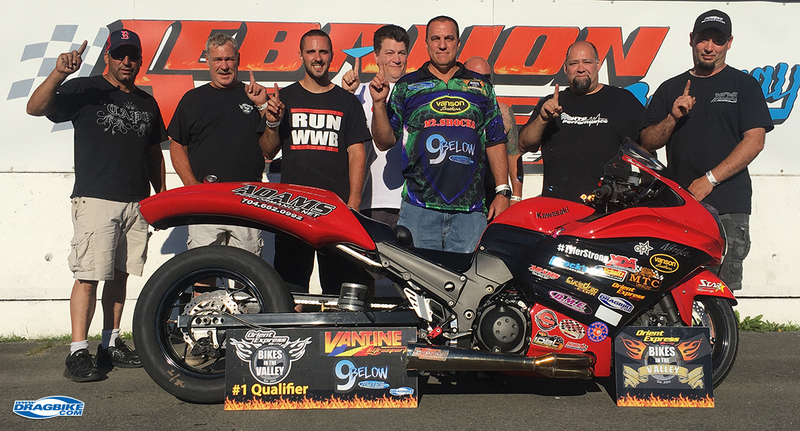 He used the best reaction time of all of the eliminations – a .004 to get it done! 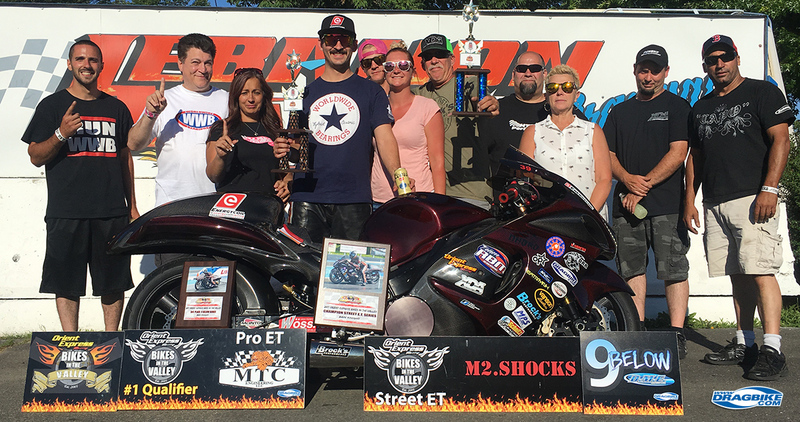 In M2 Shocks Street, Ben Knight got to the final and was able to seal the deal when he nailed his best reaction time of eliminations in this class (.017) to get him the win over Joe Ferraro. Ben ran 8.827 on his 8.73 dial, while Joe ran 9.208 on his 9.13 dial. With the exception of round one and the final, Joe had better reaction times than his competitors. Ben had better reaction times than his competitors in every round except for rounds three and four. In both cases, good jobs judging the finish line helped when the reaction times were not enough. The best reaction time of eliminations in this class was shared by two riders. 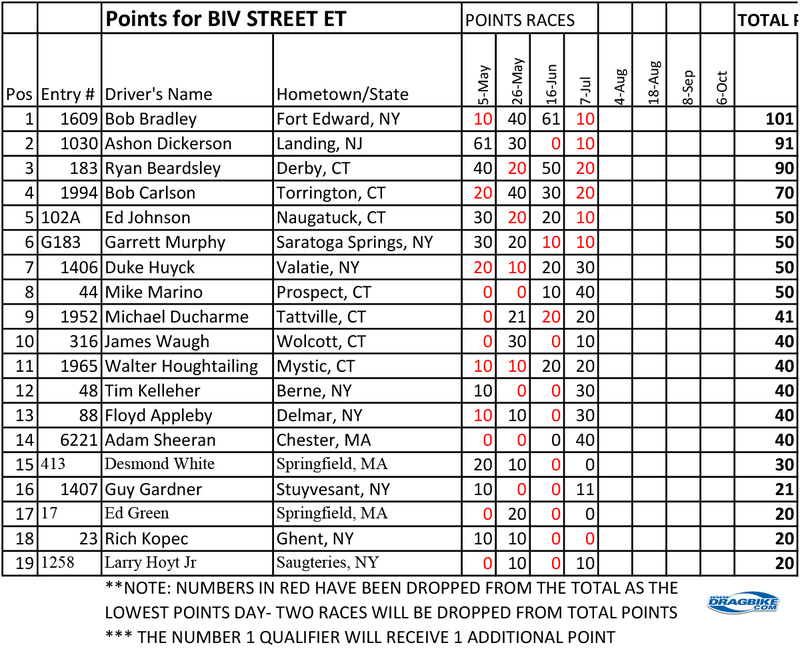 In round two Michael Ducharme had a .006 in a losing effort against Duke Huyck, and in round three Andre Green used a .006 to dispatch of “Fast Floyd Appleby”. 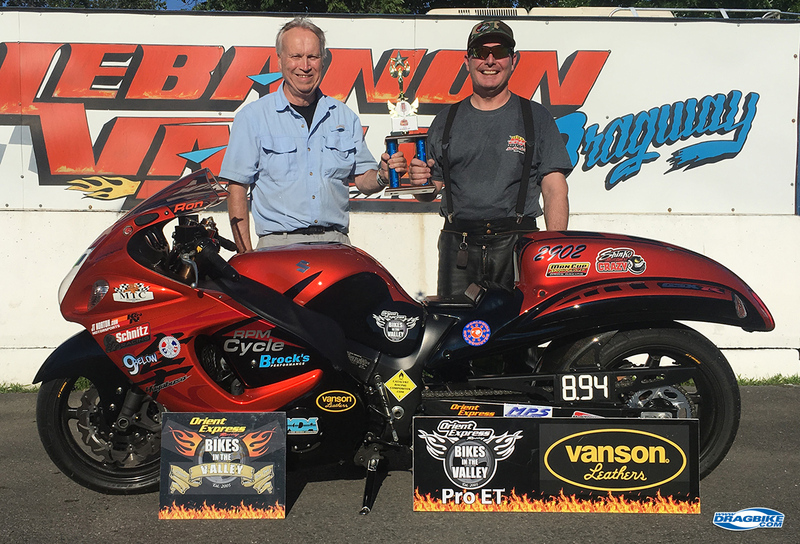 Just before the sixth and final round of Vanson Leathers Pro, my Buddy Bob Carlson who had been helping me announce the race for the last few rounds predicted that “Ron” would win. Good call Bob, since both riders in the final were named Ron. Did I mention that Bob had been eliminated by round two in all three classes? In case I didn’t, Bob was out by round two in all three classes. That never happens! 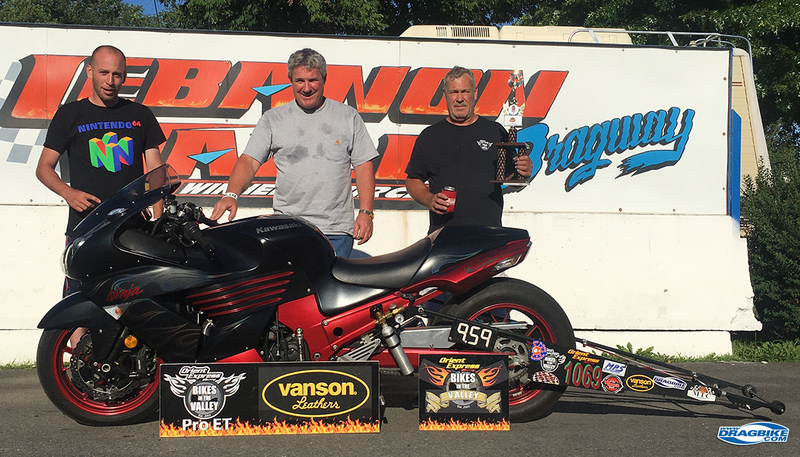 The final came down to Ron Blake on his Kawasaki taking the win over Ron LeGault riding his Suzuki. Only a difference of .002 in reaction time separated the riders after they left the starting line. When they got to the stripe, Ron Blake was able to run closer to his dial for the win! Ron Blake ran 9.706 on his 9.59 compared to Ron LeGault’s 9.188 on his 8.94 dial. Ron Blake’s best reaction time was a .002 in round one. Ron LeGault’s best reaction time was .040 in round five. “Doctor” Jeff Tisdale had the best reaction time in eliminations with a .001 in round 1. Next race is August 4 sponsored by Face First and Carlson Heating, come out on August 3 and race the ‘Night of Fire’ race, and stay for Sunday points event with an extra payout from Mike Fitts.